Remember this? Lorelai can’t sleep. She’s staring at the window expectantly, maybe fantasizing about Max Medina bursting through it. Maybe she can’t sleep because she forgot to take her earrings out. Or close the curtains. Wait, there aren’t any curtains… what’s that about? She comes downstairs in a cute red long-sleeved tee and pulls the sash window open, hangs her head out and breathes in the chilly air. It’s a moment of care-free innocent enjoyment and Lauren, with her hair in bunches, is so cute it’s almost annoying (‘how can you be so adorably cherubic? !’ I want to shout, pinching her porcelain cheeks, tears streaming down mine). You kinda get the feeling Lauren Graham does this kind of thing for real while Peter Krause rolls his eyes; she’s effortless. Hey wait up, there are no curtains in the living room either! What’s the deal with that? Back to clipping coupons, Lorelai. So anyway, with the icy wind blowing the netting around, she finds a spot on the sofa and replays Max’s bashful answerphone message (“It’s Max. Medina. Maaax Medina”) and on the second playthrough, it wakes Rory up. Like any sane person, Rory goes to close the window because it’s freezing and rolls her eyes when Lorelai stops her and begins her first diatribe on her love affair with snow. Because she can smell it. 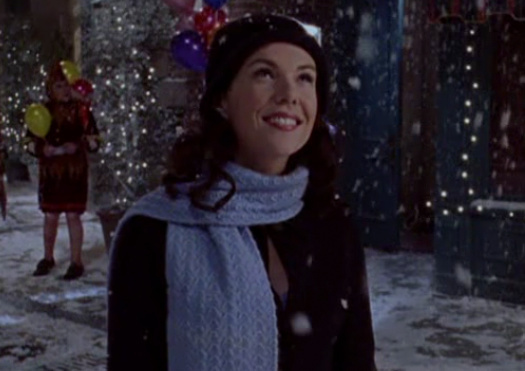 Lorelai: Everything’s magical when its snows, everything looks pretty. The clothes are great. Coats, scarves, gloves, hats. Lorelai: Do you know the best things in my life have happened when it snowed? Rory: Why yes, I do. Lorelai: Your first steps, they all happened when it snowed. Lorelai: I feel good. Tingly. And after Rory goes back to bed, Lorelai hides under the blanket and listens to Max’s message again. Ah, new love. I love snow too and it’s been snowing here. It’s magical and Christmassy and jogs some of my favourite, funnest memories. SNOWING!!! Lorelai: Me and snow, we are through. It was years of bliss y’know, we had good stuff and good times. I could show you pictures of snow angels I’ve made but I am done! Done!! Luke: Well, let it down easy OK? But at least there’s Luke’s to rant to and later on, to deliver a home-made ice rink. What d’ya know, looks like they made up in time for New Year. Happy Holidays to all our Gilmore News readers. Keep Warm and Best Wishes for 2013! LOL re the curtains! What’s that about? I like the role reversal between L&R here. Also, Luke giving Lorelai an icing rink is one of those melting moments. Snow’s great….particularly when it gets cleaned up well enough that you can drive or walk around.The two best ‘falls of the year are the first one reminding you of the quiet and beauty it can bring and the last one in March or April that let’s you reflect on making it through another winter and looking forward to spring. If anyone needs any they are welcome to half of what we got today. That would still leave us with close to 10″ over the last 24 hours. Have a good holidays and see you next year!! This was a nice post. I often forget what I write and when I come back to it, it’s like it was written by a stranger who mostly shares my opinions. It’s been a fun year, GilmoreNews-wise, and somehow I’ve managed to keep up with the blogging, albeit only on a weekly basis. I still do hold out hope for some form of Gilmore Girls reunion, whether it be the actors or just a couple of the characters in a short but Palladino-authentic scene. Things are a bit hectic Chez Dairyman but I promise to make a full Christmas post prior to Santa coming down the chimney. Hope you’ve all been good boys and girls. I had a funny feeling 2013 would see big changes for a lot of people. I hope it’s been good to you. Cheers to you too Mc. Bottoms up!